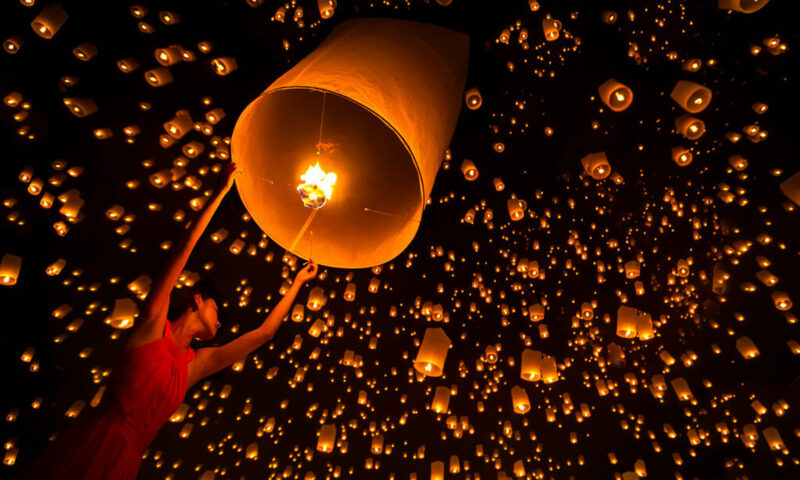 2019 Yee Peng in Doi Saket (with 3000 lanterns!!!) has been announced for November 11, 2019.
Who else wants to experience the Yee Peng Lantern Release? YeePengLanternFestival.com is THE SOURCE for Yee Peng Lantern Releases. YeePengLanternFestival.com has been facilitating this once in a lifetime experience for the past 7 years(previously trading under our other website CMStay). Discover Yee Peng’s “Thousands of lights” experience with us, the tried, the tested, the SOURCE! Tickets are sold in consecutive order. Buy now to get the closest seats. The VIP tickets are now SOLD OUT . If there are any agency returns, we will make them available here. Until then, Standard tickets are available. *** MAR 29, 2019 – We’ve received a small lot of VIP back from other agents. They are available for purchase while they last. *snacks and dinner set (VIP ONLY). *Release flower Kratong on the river. 7:30PM – Welcome speech by the village head. 8:30-9:00PM – Return to Chiang Mai. 2. We do not recommend bringing small children. If you do, the child will be under parents own care and will take full responsibility for the child. We will not be responsible for any issues that may arise. 3. We will do random checks on ticket upon entry at the venue. Please keep you ticket and ID copy with you at all times. You are only allowed to enter zone listed on your ticket. 4. If there are any unforeseen events such as natural disasters and/or government orders, which may be the cause of the failure/cancellation of the event, the organizers reserves the right NOT to refund for any/all such cases.